A short tail to the southeast (lower left) can just be made out in this animation of 15 images, stacked into three sets of 5, each exposure 30 seconds in length. 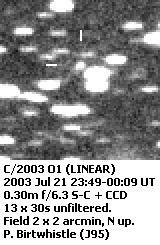 Discovered by LINEAR on images taken 2003 July 19 around 06:16 UT, this object was put onto the NEO Confirmation page later the same day. 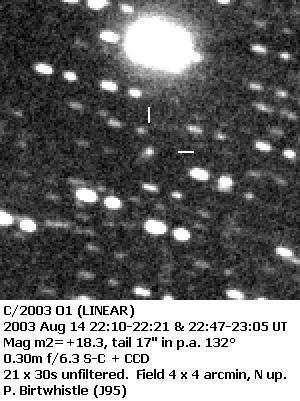 Observers at Ondrejov (557) were first to confirm the object's cometary nature and together with the description from the images above from Great Shefford it was enough for the Central Bureau to issue Central Bureau Electronic Telegram CBET 32 announcing the new comet, in advance of formal announcement through the IAUC's. Two nights later and the faint tail is again visible in this 6.5 minute exposure. 2 days after full moon and C/2003 O1 was displaying its short stubby tail. Because of a break in exposure the stars appear as two trails each, rather than one continuous trail.